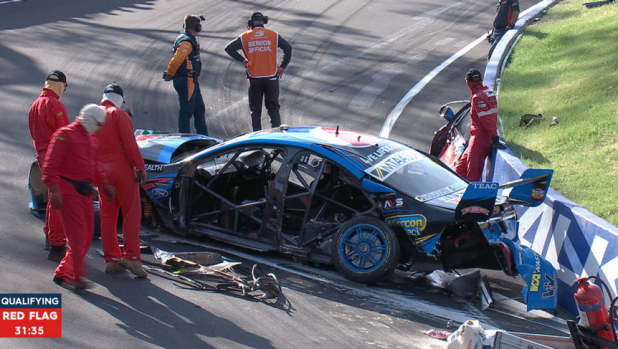 Qualifying for Australia’s biggest motorsport event, the Bathurst 1000, was halted early into the opening session after last year’s winner, Chaz Mostert, crashed heavily. Mostert’s car bounced from wall to wall on the tricky Forrest’s elbow section of the Mount Panorama Circuit, before coming to rest in the middle of the track. 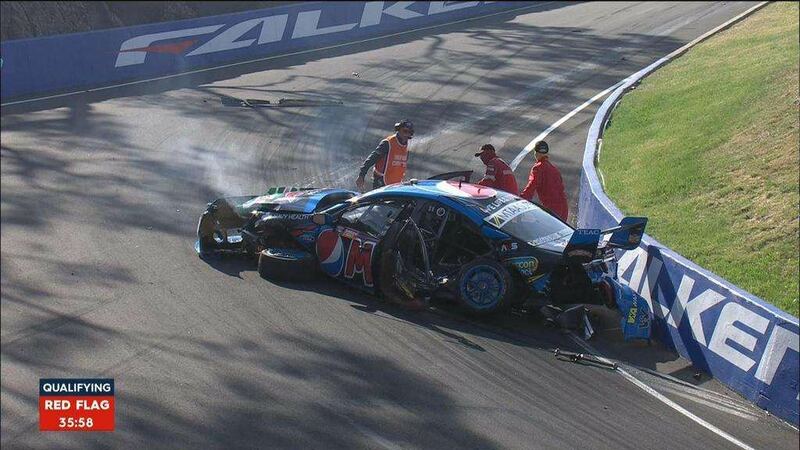 The Pepsi Max Falcon V8 Supercar was approaching 120mph when Mostert lost control and came terrifyingly close to flying over the wall and off the circuit, where it would have then rolled down the mountain. Mostert was airlifted to hospital with a fractured leg and wrist. Five marshals were also caught up in the incident; four have minor injuries and a fifth has been taken to hospital and is in a stable condition. Mostert had been favourite to claim pole on the mountain and was hoping to take back to back wins in Australia’s Great Race. He was second in the V8 Supercar Championship standings, behind team mate Mark Winterbottom. Qualifying is due to recommence on Saturday. Those marshals had a seriously lucky escape. are the V8s televised over here? | are the V8s televised over here? Also in HD on BT Sport Europe at 12am on Saturday night /Sunday morning, if you have that @Big Pimp Happy to report that the marshal who was taken to hospital has no major or serious injuries. Chas Mostert is undergoing surgery to a clean break to his left femur. Practice has also been rescheduled and will take place at 00:20 on Saturday, UK time. Qualifying and the pole shootout will be at around 02.30 am, UK time. Must set this to record. Havent got a chance to watch any races this year, must get googling to see whos been doing well this year.